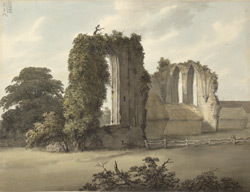 View of the ruins of the Manor Abbey, in Halesowen, Shropshire. These huge arches covered in foliage are a reminder of how impressive the abbey would once have been. It was built in the 13th century when King John gave land to French monks to establish a religious community here. The monks controlled about 4,000 hectares of land and as well as the church buildings they also constructed a fish farm and a mill. The abbey was closed in the 16th century during the Dissolution of the Monasteries. The name Halesowen means ‘Owen’s Nooks’ and it is derived from the old English work ‘halh’ meaning a piece of land ‘nook’, and after The Welsh Prince Owen who lived here in the 13th century.